People seem to have mixed feelings about Google Translate. On the one hand, you will see it used for everything and anything by people who swear by it; whereas, another category of people would not touch it with a six-foot pole. So how useful is Google Translate and should you use it for your business? Google Translate can be a wonderful tool for businesses and individuals. Let's say you are planning on going on holiday to Rome. You can use Google Translate to gain a general understanding of hotel websites. Or, imagine your business is contacted by a foreign company and that, although their email to you may be in English, their website is not. 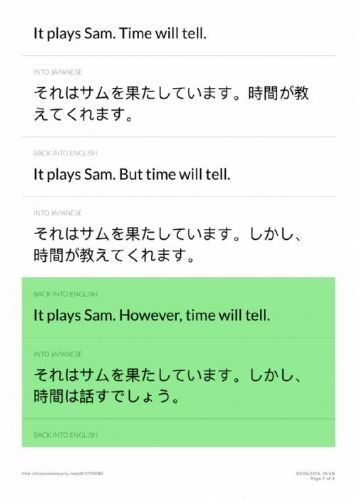 Google Translate can allow you to quickly see what they do, where they are based and perhaps gain some insight into the type of partnership they could offer . When it comes to getting a general understanding of material in a foreign language, Google Translate is absolutely brilliant. However, Google Translate reaches its limits when it comes to creating a precise, culturally-sensitive translation. Although its machine-software can be quite accurate, it still struggles with determining the exact meaning of the word to translate (e.g. A "tote" can be either a handbag or a plastic bin - a human can use their understanding of the context and situation, and occasionally their intuition, to select the correct meaning and therefore the appropriate translation, whereas Google Translate works on a probabilities' game). In addition, some expressions, such as proverbs, cannot be translated literally (the literal translation of the French proverb "L'habit ne fait pas le moine" is "The vestment does not make the monk". However, its true meaning is closer to the English expression "Don't judge a book by its cover"). Another issue is that of cultural appropriateness. Certain expressions or words can have a different meaning in another culture, so a literal translation may sound rude or inappropriate to your target audience. Take for instance the Spanish town whose turnip festival was translated as something X-rated (you can read more about it in this newspaper article)! Google Translate works using statistics, so if you take a sentence in English, translate it into another language and then translate it back into English, the result may have nothing to do with your original phrase. For example, let's take the classic quote from Casablanca: "Play it, Sam. Play As Time Goes By". After going back and forth a few times between English and Japanese (courtesy of the Translation Party! 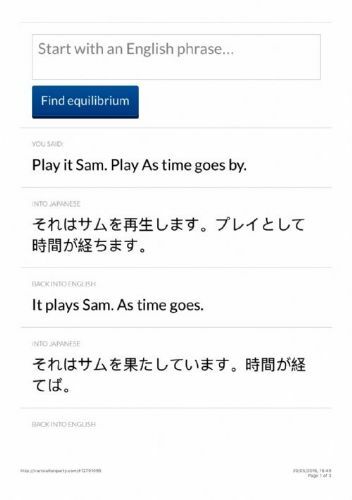 website), the English becomes "It plays Sam. However, time will tell". In summary, if you want a 'for information only' translation, then Google Translate is perfect. It is accurate enough to give you the gist of a website or document; and, as it is free, it can allow you to decide whether you are interested enough in the content to get it translated professionally. However, if the translation is intended for publication (online or paper) and will be read by the general public, you would be better off using a professional translator to avoid accidentally confusing or insulting your target audience.